With travel and tourism accounting for the fourth largest industry in the UK, this report looks at some of the key issues and impacts of Brexit on the tourism industry. Tourism is the country’s fastest growing sector that currently employs in excess of 3 million workers and contributes over £130bn to the UK economy, according to a UK Parliament report. The UK tourism sector is highly developed and is the sixth largest tourism industry in the world based on value. 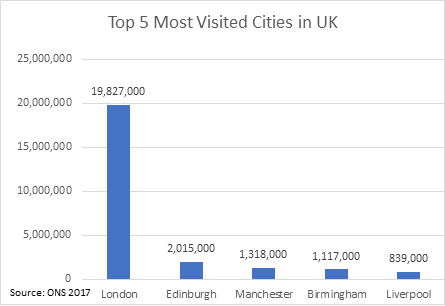 London, which is Europe’s most visited city, has a disproportionate share of the number of UK overseas visitors, with almost 20 million visits in 2017, (followed by Edinburgh with 2 million visitors). *For journalist enquiries related to Brexit, please visit our media page. The majority of overseas tourists visiting the UK come from the EU. 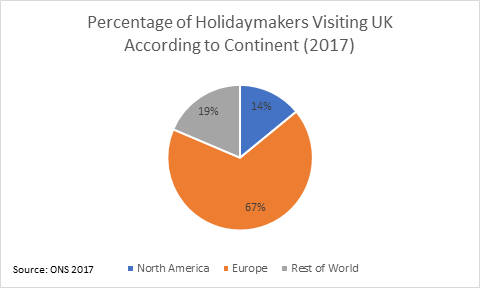 In total, 67% of visitors to the UK in 2017 came from EU countries, with a high proportion coming from France, Germany, Spain and The Netherlands. EU Nations account for 8 out of the top 10 countries whose holidaymakers visit the UK. The UK tourism and hospitality sectors are reliant on EU migrant workers, who make up an estimated 12%-23% of the industry’s workforce. As the tourism sector continues to grow, it is estimated that there will be a need for an additional 62,000 workers per annum in order to meet growing demand. As the United Kingdom and European Union continue negotiations as to the future post-Brexit relationship, there are critical issues on the table that will influence the future of British tourism. Since EU countries are so crucial to the industry, both in terms of labour and overseas visitors, key questions arise as to how the post-Brexit environment will look, namely with relation to freedom of movement, labour, and aviation agreements. Will EU citizens who currently live and work in the UK be allowed to stay post-Brexit? An estimated 12%-23% of the tourist sector workers are EU nationals. The British Government have indicated that current residents living in the UK would be allowed to remain in the UK. As the tourism industry continues to grow rapidly it is estimated that an additional 62,000 workers per annum will be required in order to keep pace with current growth rates. Where will these workers come from? Will EU citizens (who do not currently reside in the UK) be able to work in Britain post-Brexit? Culture and language are key components of the tourism sector and the sector needs French, German and Spanish speakers to meet industry demands from hotel receptionists to tour guides. Will EU nationals continue to enjoy visa-free access to the UK? Under the Freedom of Movement, citizens of the EU can travel to Britain without the need for a visa. The UK government seeks to keep visa-free travel between the UK and EU. However, its unclear what would happen should no-deal be reached. The EU has suggested that it would impose a visa fee on Britons visiting the EU. It remains unknown the potential impact of Britain leaving the customs union, a potential adoption of WTO rules and the imposition of tariffs could have on the travel industry. The fall in the value of the British pound is seen as a positive development for the UK tourism market, as it makes the UK a cheaper destination for overseas visitors, with record numbers of tourists visiting since the Brexit referendum. 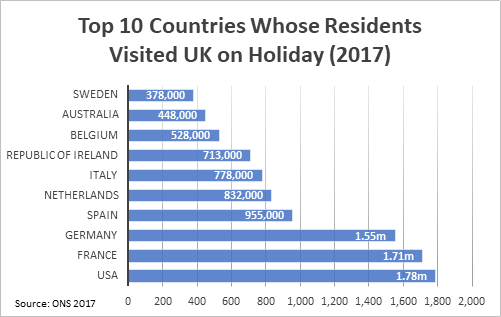 Likewise, since it is becoming more expensive for UK citizens to holiday overseas, more and more Brits are choosing domestic holidays within the British Isles. The UK has the busiest airport system in the world. One in every two passengers handled by the UK is flying to or from the rest of the EU. The UK has the third largest aviation network in the world and the largest in Europe. The UK is currently part of the single aviation market, an agreement that enables EU based airlines to fly to and from any country with the 28-member bloc. It also includes an open skies agreement with third countries, such as the EU-US Open Skies agreement, which allows airlines on both sides unrestricted access to each other’s market. Major airlines have raised concerns if the agreement were to be cancelled. Easyjet has setup an EU-based airline to ensure it can continue to operate unaffected in Europe, regardless of the Brexit outcome. Ryanair, an Irish company whose largest base is at London Stansted airport, has added a “Brexit Clause” into tickets it sells from the summer of 2019, saying customer tickets will not be valid should the issue of aviation regulation remain unresolved post-Brexit. British Airways and Virgin Atlantic have taken more in different positions, expressing optimism that agreements would be reached between the EU and US to make sure that travel would be uninterrupted post-Brexit. There are moves by Visit Britain, the British tourism board, to encourage a diversification of the sector in the wake of Brexit. The UK Government is actively trying to diversify away from the EU, seeking out new partners in countries like China, where the market is relatively underdeveloped but has enormous potential for growth.